Getting to Know Web GIS will be a popular workbook for students interested in learning how to build web GIS apps quickly. When Pinde Fu wrote Getting to Know Web GIS, he drew upon his 15 years of experience at Esri developing web GIS apps and teaching online web GIS courses at Harvard University Extension, the University of Redlands in California, and Henan University in China. But he almost ended up being a geography teacher in China. Growing up and going to school in a small city in central China near the Huang He (Yellow River), Fu was steered toward geography because geography instructors were needed. "I was good at mathematics. I wanted to do something in that major," said Fu, now a senior web GIS developer and project lead for Esri Professional Services in Redlands, California. "But I was also very good in geography." Fu earned a bachelor of science degree in geography from Henan University in 1991. While there, he heard a lecture about a new technology called GIS given by professor Jiulin Sun, the man he later collaborated with on Web GIS: Principles and Applications. Inspired by the idea of digital mapping, Fu enrolled in the Chinese Academy of Sciences in Beijing, where he earned a master of science degree in GIS. He also earned a PhD in GIS from the University of Kansas. GIS was a natural fit for Fu in the 1990s when young people in China, like in other parts of the world, were becoming fascinated by computers and what could be accomplished using them such as making digital maps. "I loved computers, and I loved the Internet," said Fu, who started to build web pages in school. Though rudimentary, the early iterations of web GIS fascinated Fu. He realized what revolutionary changes web GIS could bring shortly after he went to work for Esri China (Beijing) Holding Co. Ltd. in 1994. "In 1996, I developed my first web GIS application using [Esri's] MapObjects Internet Map Server. It was an underground pipeline viewer," he said. 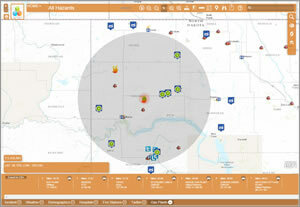 Fu used Esri's Web AppBuilder for ArcGIS to create this incident management widget. The browser-based application was a prototype for a Chinese city. Staff could query a specific pipeline by typing an identification number into a search box. "The application was not too advanced compared to today," said Fu. "But at that time, it was just amazing to me." Since then, web GIS applications have become much more sophisticated, with capabilities such as spatial analytics and tools to create 3D web scenes. Since joining Esri stateside in 2000, he has helped develop web apps for organizations such as oil and gas companies; electric utilities; hospitals; cities such as Beverly Hills and Los Angeles, California; the US Geological Survey (USGS); the US Department of Housing and Urban Development (HUD); and the US Environmental Protection Agency (EPA). "In doing these projects, I saw the power of GIS being amplified by the web and solving all kinds of real-world problems," said Fu. "I love what I do." Fu particularly likes Web AppBuilder for ArcGIS in ArcGIS Online for creating web apps. 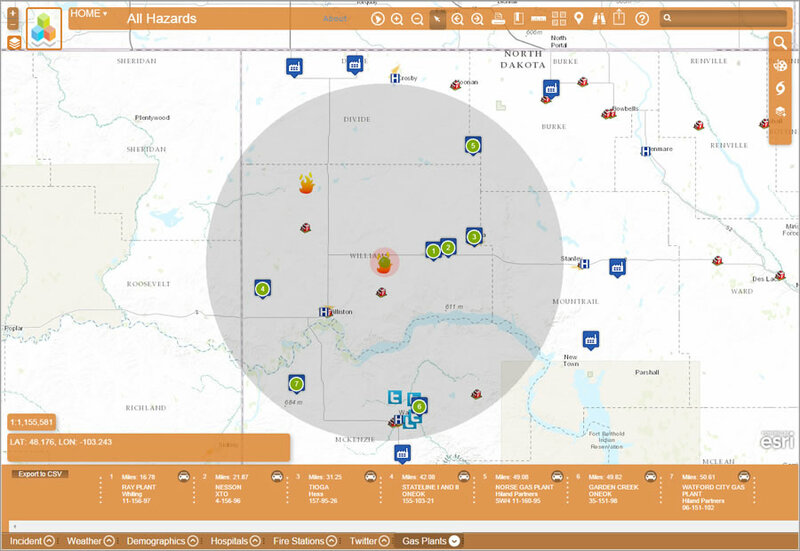 Web AppBuilder for ArcGIS can be extended through the creation of widgets such as the one Fu created for incident management, which shows the locations of hazards such as wildfires, live weather feeds, demographics, hospitals, fire stations, gas plants, and social media feeds. 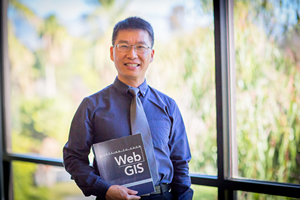 "Web AppBuilder for ArcGIS is going to be popular," said Fu. "It's a new tool for quickly building web GIS apps without doing any programming. You can pick a theme for your look and feel of the app, add a map and widgets, customize your banner, and deploy the app."